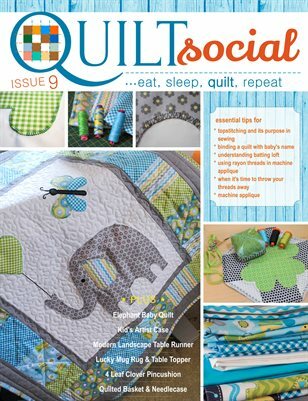 Here's another informative and unequivocally fun issue filled with leading edge quilting and sewing products to explore. We're working with modern quilting and adding some old fashion charm to it; we use current accessories and explore the art of machine embroidery. We're also looking at machine applique and how to use it in different quilted projects. You'll also find a comprehensive talk about the characteristics and benefits of 5 Fairfield quilt battings and exploring the answer to the question 'How do I choose the right batting for my project?' We answer more questions as in 'When do you know when it's time to throw out older thread and why?' Let's not forget the fun you're going to have making the 7+ projects with full instructions in this spectacular issue! Enjoy!